A brother and sister separated during World War II, who both believed the other had died during the Holocaust, have been reunited amid a media frenzy. 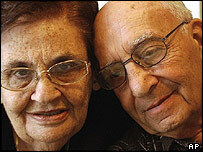 Binyamin Shilon and Shoshana November last saw each other in their native Poland in the 1930s. But last week a chance discovery led to Shoshana finding that her brother lived only a few miles from her Israeli home. At their emotional reunion Binyamin said finding his sister after so many years was "a miracle". The pair may never have been reunited had Shoshana not paid a visit to Yad Vashem, Israel's official memorial to victims of the Nazi holocaust, where survivors' records are kept. She was left stunned when staff at the memorial revealed that their records showed her brother was alive and living only a 90-minute drive away. Last Friday, Binyamin received a phone call from Shoshana's grandson, asking if he recognised the Szlamowicz name and whether he had a sister called Ruja - Shoshana's old Polish name. When Binyamin said that he had, he was asked if he wanted to speak to her. "I looked for her and my siblings during all the years after the war," Binyamin later told Reuters news agency. "I grew up alone and I was immune to crying, I didn't know how to, but [that] night, I cried." The pair - both married with several children - had an emotional reunion the following day. "We jumped on one another and we hugged and kissed and it was hard to talk - it was hard to think," Shoshana said. "Today, even, I don't believe it." The only downside, the pair say, has been the constant stream of visitors, journalists and well-wishers who have prevented them from being able to fully catch up. The siblings were separated in 1936, when their father - later shot dead by the Gestapo - left home and their mother placed the pair and their two brothers in orphanages. After the German invasion of Poland in 1939, Shoshana was sent to the notorious Nazi death camp at Auschwitz, where, she says, she escaped the gas chamber only when a woman pushed her into the line of those allowed to live. Meanwhile Binyamin - then known as Bronik - escaped Poland to Russia and joined the Soviet Army, taking part in the liberation of Auschwitz only weeks after his own sister had left the camp. They both later emigrated independently to Israel in the late 1940s. It is believed the rest of their family - including their two brothers - were all killed by the Nazis. About six million Jews died in the holocaust, along with thousands of political and religious dissidents, Roma gypsies, homosexuals and people with mental and physical disabilities. "Reunited after almost 70 years"